For the longest time, baby showers have been thrown to celebrate a mother-to-be and her new little baby, but dad has been left out, feeling alienated from the celebration. Over the years, fathers have become more involved with their children, and they want to celebrate the arrival of their babies just like the women do. After all, the baby is still half theirs, right? Recently, mixed gender baby showers have become more common, allowing the new dad, uncles, grandfathers, and guy friends to be included. However, some dads don’t want to have to “ooh” and “aah” over all the cutesy baby clothes; they just need a day with the guys to celebrate the arrival of their new little baby. 3 What About Cloth Diapers? So, you are probably asking yourself, “What the heck is a diaper party?” You are not alone in this; I only found out about them recently. Just like every invitation includes the 5 W’s, we are here to give you the details you need to throw your own successful diaper party. What: A Diaper Party is a guys only party for the Dad-to-be, where instead of the cutesy Mom gifts they are given…. diapers. Why: It is mostly an excuse for the new Dad to have a party with the boys, and also get some parenting advice from other Dads. It is also practical because babies will go through 3-6 diapers per day. Who: No women allowed: Just the guys. When: Usually on the same day as the baby shower – for obvious reasons – but can be held at any time really. Further out from the delivery date the better so there are no unexpected surprises. Where: A location can be chosen to fit in with the theme you go for. It is also common to have it in the same place as the baby shower, just well separated – a basement or garage for example. It’s not enough to know the 5 W’s; you need to know the “how” in order to plan and execute a successful diaper party. When looking at all the details, the main thing to keep in mind is to keep everything as minimal and masculine as possible. He is (most likely) not going to be interested in all of the frou-frou decorations and cutesy gifts. However, the basic elements of a baby shower can be included, such as invitations, decorations, food, games, gifts, and party favors, just with a more simple, manly feel. 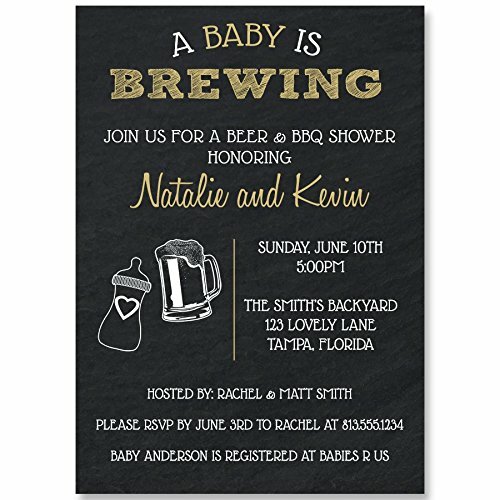 Invitations are a necessity for any get together (unless, of course, all of your friends are on Facebook), but you will not find diaper party invitations in stores as easily as you will find them for baby showers. More than likely, you will need to go the DIY route. Thankfully, there is a great database for all things DIY and party planning: Pinterest. Now, I do not expect men to be scouring Pinterest for hours, pinning all of his party ideas, but it can be a great place to get a few quick ideas for invitations. Considering that the party is not usually organized by the expecting family, but rather a member of dad’s family or a close friend will be the one to organize and host the party, it will be up to this person or group to create and mail the invitations. The only thing dad should be responsible for is coming up with a guest list. Invitations should be sent about 4-6 weeks before the event (just like any baby shower), and you should expect an RSVP no later than 2 weeks prior to the party so you can plan for food, favors, etc. 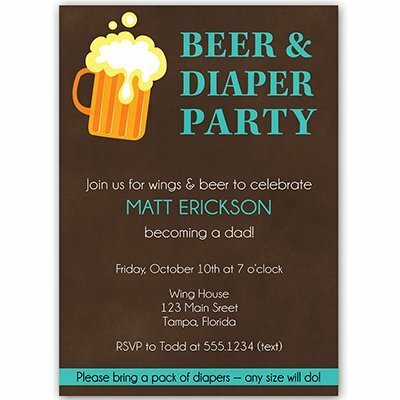 There are some great templates you can find for diaper party invitations that are simple (sometimes a bit cheesy, but being a dad gives you a right to be cheesy) in design, and can easily be altered and customized to your preferred tastes. If you are having the baby shower on the same day, you can even combine the invitations. This keeps preparation minimal, and you can even delegate invitation design responsibility to the woman planning the baby shower. You will probably be tired of hearing the word “minimal” by the time you’re finished reading this, but it is key for throwing a successful diaper party. So, when it comes to decorations, you will want to keep it minimal. There is no need for all of the baby-themed banners, color-coordinated balloons and table settings, and all of the girly stuff you find at a baby shower. Dad is just interested in getting together with his friends and eating good food. Now, that is not to say there cannot be a few preparations in the decoration department. You do want it to look like a party, after all. You can go with color-coordinated flatware (just plates, cups, and cutlery), perhaps in a diaper brand color scheme – red and white for Huggies, blue and yellow for Pampers – or you can base it around the theme – dad’s favorite sports team, black, red, and white for poker night, etc. A single, central baby-themed decoration would also be a nice addition to keep the reason for the gathering in focus. Diaper cakes (literally a cake made out of diapers) are an extremely popular feature at a baby shower, and you can customize one for dad’s party too. Unless you are a crafty dude, you can have one of the women involved with the baby shower make a diaper cake to display at the party, perhaps with some beer cans thrown in to make it more masculine. It’s simple, and gives a few more diapers to use in the future after it’s disassembled. This is the part that needs the most thought and preparation. After all, it is the real reason these guys are getting together. You do not need to go all out when it comes to food and drinks, but simply choosing a few good “guy” foods will make a great party. Most diaper party themes are based around cookouts and/or beer. You, of course, are not restricted to this, but it is a good starting point when it comes to selecting food. A backyard barbecue is sure to satisfy any guy’s hunger. Finger foods are also a necessity. Pretzels, nachos, veggie trays, meat platters, and chips are all great ideas to include on the buffet table. Let’s not forget the cake; it isn’t a party without one. You can find some fun diaper party cake ideas on Pinterest: a beer can with a diaper, a branded diaper package, a sports field (baseball, football, soccer, etc. ), and so on. You can easily find a friend or a custom baker who can create one of these cakes for the party. Let’s be honest: most guys do not care about all of those party games that you find at baby showers. Omitting them from a diaper party will save you planning time and will make hosting much easier, since there are no games for you to lead. There can still be games, though; just, perhaps, guy-like games. If you are just looking for a way to keep the guys entertained, an evening of poker or adult board/card games, or even catching a game on TV, is sure to make them happy. On the other hand, dad and the guys may still like to play those popular baby shower games, or just games with a baby theme. You can just plan them with a masculine twist. Don’t Say ‘Baby – This is a very popular game at baby showers. Everyone is given something small to wear (like a clothes pin or necklace), and if someone hears you say “baby” at some point during the shower, they can steal your object. 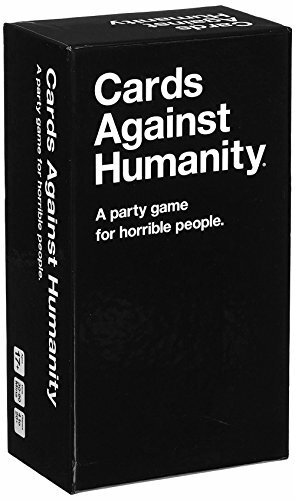 The person who has the most at the end of the game wins a prize. For the guys, try using clip-on bow ties to play the game. Blindfold Diapering – This one isn’t really played any differently as it would be at a baby shower, but it’s more popular to play with men since women are believed to have a natural sense for all things baby. The rules are simple: two people wear a blindfold and they race to see who can put a diaper on a baby or balloon the fastest. You can set up the competition like a sports bracket so that you can have one winner in the end who gets a prize. Bottle Chugging – This isn’t a game you would usually find at a baby shower, and it is extremely popular amongst diaper parties. Basically, you just fill some baby bottles with beer (or drink of choice if you are not drinking alcohol) and the guys race to see who can chug it the fastest. The winner gets a prize. As I mentioned, the main gift to bring to a diaper party is diapers. It may seem easy to just pick up a box or pack on the way to the party, but there should be a little bit of thought put into the purchase. Consider where you are buying them and the store’s return policy. If everyone brings the same size, the parents-to-be may need to exchange for a different size. You should also not go straight for the newborn diapers. Some babies, like mine, are born into a size 1. Throwing in some bigger sizes can be helpful. They will get used eventually. It may be helpful to include the size preference (as well as the amount of each, i.e. 1 box of newborn, 2 boxes of size 1, etc.) in the invitations so the parents are not overloaded. You should also never assume that the family is using disposable diapers, although if they are considering using cloth diapers, it should be specified in the invitation. I will dive into this topic later. In addition to diapers, it can be nice to get a gift for the new dad. It can be something unrelated to the baby that dad can enjoy on his own, like this mug and coffee set, or it can be a funny “survival kit” for diaper changes. Favors are never a necessity, not even with a baby shower. However, they are nice to have in order to commemorate the occasion. If you decide you do want to give the guys something to remember the day by, there are some easy and fun things you can do. How about a personalized beer glass or coffee mug? It can feature the guest’s name and/or the “title” of the party theme. 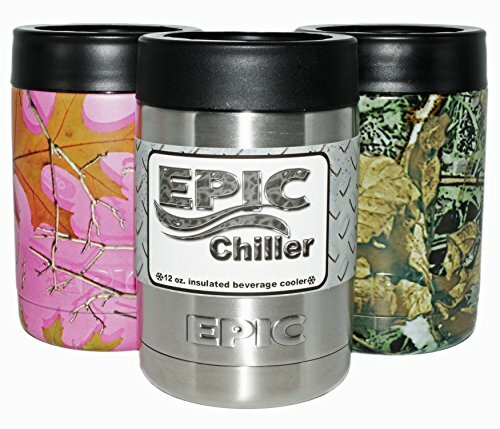 Customized beer koozies are also a great idea. The favors can also be something small based on the theme of the party (which I will go into later). If you do not want to have to worry about a gift for everyone, raffling off one or two “big” prizes can be fun, too. These can include gift cards, tickets for concerts or sporting events, or even a six-pack of a special brew. And of course, you can also go with gift bags filled with chocolates or candy if you want to make it easy and keep it super simple. Most families opt for disposable diapers due to their convenience. However, a small percentage still choose to use cloth diapers, and the “trend” seems to be growing. Millennials, in particular, seem to be going back to old traditions, such as cloth diapering, exclusive breastfeeding, home births, and co-sleeping, with the decision to cloth diaper heavily based on cost efficiency. Putting together a diaper party for someone who is planning to use cloth diapers can be somewhat tricky, particularly for the guests who are looking to bring gifts. So, how do you make it easy for everyone? To avoid any confusion and needless returns, there should be some sort of specification included with the invitation that lets the guests know about the family’s decision to cloth diaper. Include a little note from dad that addresses the topic, giving a brief explanation of the reason(s) for their decision. This prevent any confusion and possible kickback from attending guests (believe it or not, some people may be taken aback by the decision and may try to push their own opinion). Nearly 50% of families, even when primarily cloth diapering, may choose to use disposables on occasion. They tend to be more absorbent than cloth diapers, which is better for nighttime wear, and are a bit easier for babysitter and day care use. If the family decides that they will be using disposables part-time, you can use the diaper party to collect what they will need. This is where specifying the diaper size and amount will come in handy. You don’t want the parents to be loaded down with more disposable diapers than they are planning to use. While cloth diapers save money in the long run, the initial cost can be quite a shock to most parents. The majority of cloth diapering parents own 20-30 cloth diapers, which cost anywhere from $250 to $500 total on average. Needless to say, they may appreciate some financial help from the attendees in lieu of traditional gifts. To prevent confusion (cloth diapers aren’t as easy to select as disposables are), you can have a collection jar or donation box for cards and financial assistance. Some guests may be totally into this since it means they don’t need to go shopping for a gift. On the other hand, some guests may prefer to bring an actual gift rather than just giving money. This is where a diaper registry can be useful. Cloth diapers are widely available through big box sites like Amazon, which gives you the option to create a registry. Just include the link with the invitations, and the guests can easily see what the parents need and select what they want to bring. Many parents choose to purchase their cloth diapers through an online specialty boutique – Kelly’s Closet, Cotton Babies, Tiny Tots, and Crunchy Boutique, to name a few – and most of these have registry options as well. So, we have gone over all the basic elements of a diaper party, but what does it look like when it’s put together? As we mentioned, you do not have to go all out with a theme, but depending on the dad-to-be and his hobbies/personal tastes, you could have some fun even with a simple theme. Here are just a few ideas that can help you get started. While this list is in no way definitive, it does cover some of the main personality types you may come across with men. This is an extremely popular theme amongst diaper parties, and it is super easy to put together. 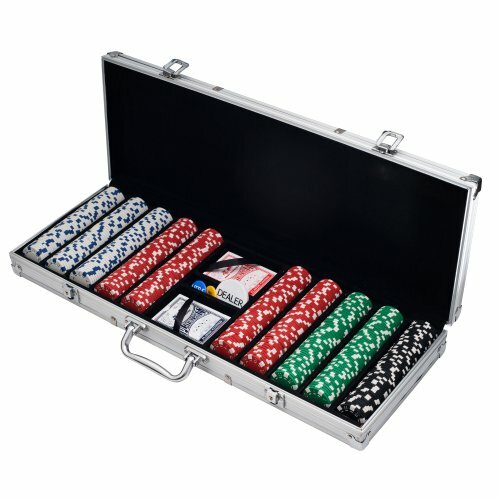 You don’t need a special venue, just a basement or cozy garage, and you don’t need to organize extra games since it’s all about poker. Start the night by collecting everyone’s diapers at the door; these will be their buy-in for chips. You can even make it more interesting by offering chips based on the number of diapers each guest brings. Keep decorations simple. If you have a poker table handy, that’s about all you need. However, if you want to add a few more decorations, like streamers, banners, or balloons, stick to white, black, and red for your colors. There is nothing wrong with providing an actual meal, but for poker night, snacks and finger foods (and beer!) may be more appropriate. This way the guys can continue to eat while they’re playing. At the end of the event, you can award the winner (with the most chips) a big prize, like a beer and snack gift “basket,” grilling supplies (tools, sauces, and spice rubs), or event tickets and gift cards. Most guys like sports, whether it is playing or watching, so you will come across a lot of sports-themed diaper parties in your Pinterest or Google search. So, why not create your own tailgate party in the basement. Plan the party for the day of the big game, whatever sport or team that may be (based on dad’s preference, of course). Find a roomy but cozy location with a big screen, and plan for lots and lots of food. Beer is a popular choice, not only for tailgate parties, but also for diaper parties (“Huggies for Chuggies” or “Baby is Brewing”). You can accompany that with classic stadium food, like soft pretzels, hot dogs, pizza, popcorn, and nachos. In addition to diapers, dad can be gifted with sports-themed gifts to be shared with his little soon-to-be athlete. This, of course, would be more popular if the baby is a little boy, but there are fun gifts you can get for girls too, like this little gym bag play set. 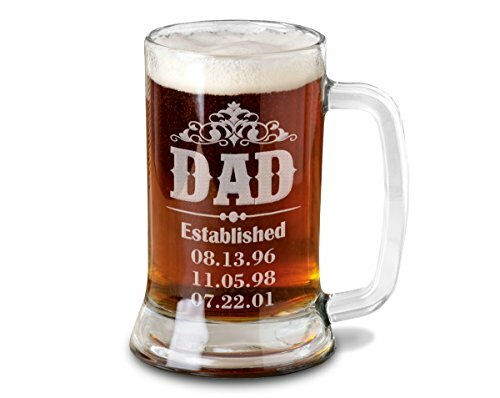 After the game is over, the guests can leave with a personalized pint glass, perhaps with a designed logo for “dad’s bar” (using dad’s name). As a fun gift for dad, all the guests can sign a kid-friendly sports’ ball as a reminder of the fun day you all had together. If the dad-to-be is like my husband, he may not be that much into sports (unless it is soccer), but, rather, he may be into board games and Star Wars. If you want to play it up a little more with a theme, this type of party can be a lot of fun. If dad or one of his guests has a great home theater system or a great basement space with a TV, consider hosting the party there. You can have dad’s favorite movie playing, accompanied by trivia and/or commentary if you desire. You can keep food light and easy (think movie theater), or you can scour Pinterest for fun themed ideas. Pretzel sticks can be turned into magic wands or lightsabers, drink labels can be changed to feature magic potions or anything else along those lines that you may find if dad would enjoy it. Games can feature trivia, video games, or strategy board games, which require very little to no preparation and hosting. 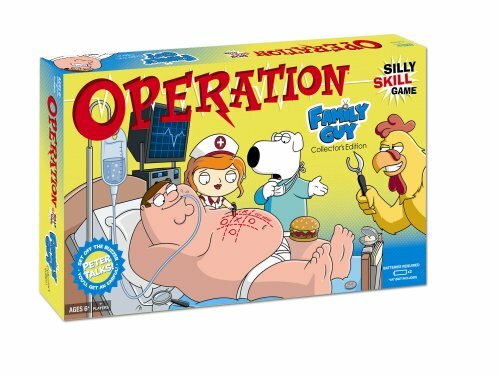 Gifts can include board games for kids in addition to diapers. And favors can be movie tickets, DVDs, or games. If the dad-to-be loves music or is a musician, you can find loads of great ideas for music-themed parties. It can be a great time for dad’s musician friends to get together for a jam session, or it could just be a laid-back party with a great playlist in the background. Invitations can be made to look like concert tickets, inviting the guests to “rock out” to their favorite songs. If you want to host a jam session, you can look for a local church or community center with a sound system that may let you rent the space for the party. Otherwise, you can set up in a garage or basement (probably not where the women will be though). You can even incorporate music-based games into the party. Make a playlist of songs to play at the party, including songs that have the word “dad”, “mom”, or “baby” (or any variation of those), and pass out answer sheets and pens at the beginning of the party. Throughout the event, the guests will write down the name and artist of the songs they have heard, and at the end of the party, prizes can be distributed, taking care of party favors at the same time. There are many baby toys that are shaped like musical instruments. Some of these, in addition to diapers, can make great gifts for dad, as well as an “autographed” photo of the party guests to commemorate the event. Most men love the outdoors, whether he is hiking, playing sports, or simply taking care of his yard. If the diaper party will be held in the warmer months, a barbecue is likely the best way to go, ensuring that all your guests have a great time. You can find a local park or just use someone’s backyard as the party location. Food is easy, as long as you have a grill to use: just some burgers and hot dogs, with some chips and soda, and you are all set. This type of party is great to have in conjunction with the women’s baby shower. It can even be a big help to them in the way of food preparation if they are okay with having burgers and hot dogs. There is no need to buy food for two parties, and the hosting lady does not have to worry about preparing anything. Games for an outdoor diaper party can include lawn games, such as washers, horseshoes, corn hole (try baby-themed! – the beanbags are baby food that you toss into the baby’s mouth), or even tossing around the football or kicking the soccer ball. It is an easy way to keep all of the guys entertained with no effort on your part. We hope that this has helped enlighten you on the benefits of throwing a diaper party, as well as shown you how easy it can be. There is very little to do in the way of prepping and planning, making it the ideal guy’s party thrown by guys. Just a day with friends to celebrate the impending arrival of a new little family member, where you are gifted with all the diapers you could need to start your new family. What better combination is there for an excuse to throw a party for the dad-to-be? If you have any questions regarding diaper parties, or if you have thrown one and have great ideas and suggestions to help other parents out, be sure to share in the comments below. And share this article with other parents and guys who may be looking for ideas on how to celebrate a new dad and his baby.